Feeling off, and don't talk much anymore, unless bike-racing related. V. Bad. Spent most of day mucking about instead of getting down to writing. Decided that I would absolutely post more often if had laptop in bathtub, as best thoughts seem to come when under water. But surely cannot even attempt, as would risk electrocution. If sound posessed, perhaps by young, drunk, diary-writing British girl, understand: Have just finished reading Bridget Jones: The Edge of Reason, in preparation for film sequel later this year. Hurrah! More Colin Firth! 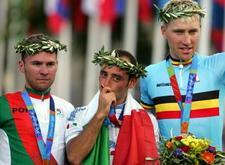 Paolo Bettini wins the Gold medal in the Men's Road Race in Athens! It was the feel-good podium of the year: relative unknown Sergio Paulinho took Silver, and Axel Merckx - son of the Greatest Cyclist of All Time - took Bronze. I haven't been this happy in months. What a shame. I'm sorry it's all effed for you now, I truly am. But, you know. You're as good as that, without all that.